Hehe... correct, because he's using TE's molds. Your Hero helmets are superb and they have no competition in my mind. Agreed. I actually dislike the Hero design and love the Stunt, but GINO's Hero helmet is the absolute best I have seen online. I think we all believe your work deserves acknowledgement over TE, and I empathize that your past dealings with TE did not go well. That being said, for those of us looking to acquire an accurate stunt helmet for $450 made out of HPDE, are you able to offer us a choice in this situation? If so, PM me, and let's talk business. If however your pricing is much, much higher, or if you don't feel you want any more than a select few own your V2, then people like me actually do *NOT* have a choice other than TE, and we have to bring our business to someone you dislike. I am sympathetic to your pain and feelings of betrayal, and I wish you didn't have to go through all that with TE. But my options are severely limited, unless in all your posts to this thread you are saying you are offering another option to collectors. OT: I love that White Fett.... planning on doing my Sgt. Fang helmet that way. Gino, I never get tired of seeing those lids! Put me on a list if/when you decide to get back to doing troopers! 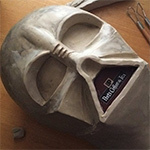 BTW, thanks for the help on my Vader -- one step closer! I understand your situation completely. You have to weigh all the factors when picking a helmet. Not just one, and cost is certainly one of them just as is accuracy. I'd never fault anyone for picking another maker's helmet for reasons such as personal preference or cost. I only get defensive if someone were to make claims about another helmet being more accurate as I am certain that they are not and don't want people being misled. I get asked about trooper stuff all the time and when I do, I always refer them to AP as I believe he puts out the best all around product (cost, accuracy, availability, trustworthyness, timeliness, durability). Mine is by far the most accurate, but if these other criteria are important to you, mine not be for you (except for trustworthyness of course). Matt's bumpy cap back is a totally refurbished shadow of its former self. It was practically destroyed with huge chunks missing out of many areas. No way its restoration would produce a screen accurate piece, but I know it gets marketed to the unknowing as such. That is unfortunate for them. Also, his formed parts are substandard when compared to the quality of other makers out there as I'm sure lots of seasoned trooper enthusiasts would agree. Not to mention, he's a pretty unstable guy. Send money at your own risk. Don't take my word for it, ask around. I haven't made any new helmets for a few years. I might be selling off one or two from my personal collection at some point in the future, but I haven't decided. If I do, I plan to auction them off as they are really rare and limited. I think things lose their special-ness when there are lots of them floating around. It's very important to me that the stuff I make or offer maintain its special-ness. Here's a pic from me. Isn't the AP supposed to be smaller than the TE? I think I had seen some comparison shots on MEPD.net and for the life of me I can't explain why the AP is smaller, if it's supposedly accurate. Some of it has to do with assembly, I think. It has to do with recasting. Basically a vacuum formed plastic casting will shrink slightly as it cools and locks onto the mould if left to go cold before removal. If you try taking a mould from inside that casting then it will naturally be slightly smaller, so the next forming over that mould will be smaller again as it cools. The AP must be at least 3rd or 4th gen so imagine each time getiing smaller, only slightly mind you, but smaller none the less. Every replica helmet is smaller than an original due the generations. Hi TrooperMaster, I really like your stuff by the way. Would that therefore mean that a person would get a more accurate (size wise) helmet by taking a mould of the outside of the helmet and making a fiberglass helmet rather than a plastic one? Or does the fiberglass shrink to a certain degree as well? Just curious as to the technical aspect of the whole thing. I just sent you a PM. I didn't know how else to contact you. Do check it out when you have a moment. Thanks! Who's the maker of this helmet?